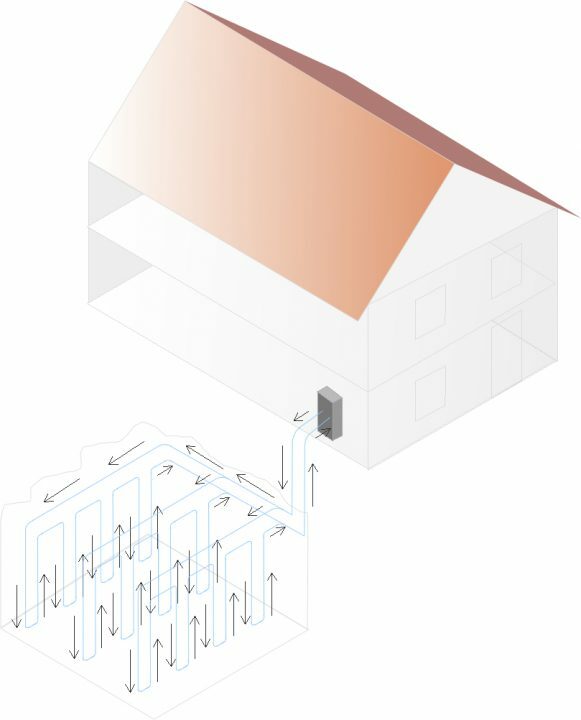 There are four main different designs of geothermal heat pump systems with each type featuring its own unique design. Three of these systems are closely related and are classified as “closed-loop systems” with the fourth design classified as an “open-loop system”. The below sections detail each of these different types of geothermal heat pump systems. Falling under the closed-loop category are three different designs that are used across the globe. The closed-loop horizontal system is one of the most common designs used in residential developments. It can be highly cost effective, especially when installed to new build developments where an adequate area of land is available. 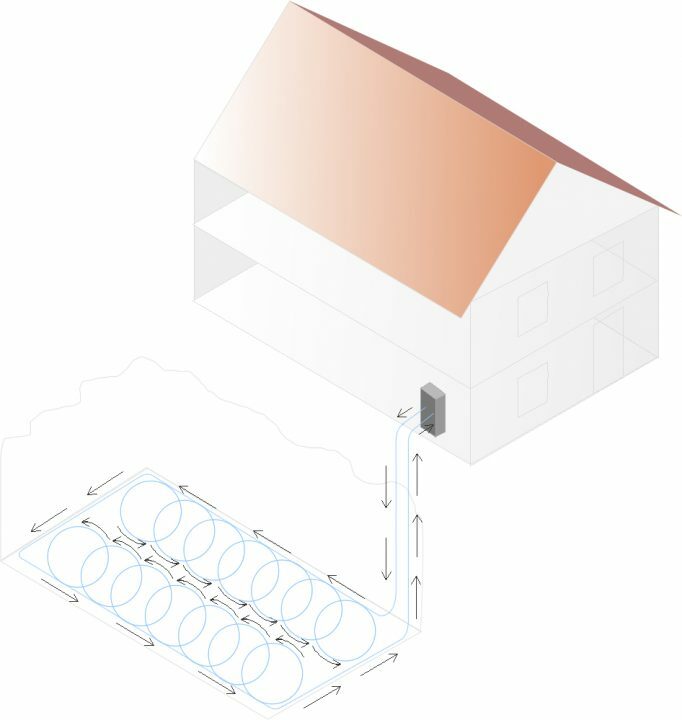 The ground loop featured in this type of heat pump system is often designed with additional loops/coils (as shown in the diagram to the right) in order to reduce installation costs and save space. Trenches of approximately 1.5m or more must be dug in order to bury the loop at a depth that will allow for the efficient operation of the heat pump. The installation of a horizontal closed-loop system is possible in areas that may not have vast spaces of spare land, however they are still unsuitable for more confined areas such as inner-city developments and business centres. The closed-loop vertical system is very similar in design to that of a closed-loop horizontal system, however instead of a horizontal loop system been installed, the loop penetrates deep into the earth on the vertical axis. Closed-loop vertical systems use a much smaller area of land compared with horizontal systems and therefore are more commonly used when space is at a premium or where only a small area of land must be disturbed during installation. The vertical holes that contain the loop system can be anywhere between 30m and 120m deep. Due to the depth of these holes, specialist drilling equipment has to be obtained which can increase the cost of this type of heat pump system. Vertical systems are more commonly installed to commercial buildings where horizontal loops would be prohibitive. Ground loop systems don’t have to be buried in order to function correctly. Geothermal heat pump systems can be installed to a pond or lake by sinking the loop into a source of water. This source of water should be approximately 2.5m or deeper in order to provide efficiency and prevent the possible freezing of the loop. A closed-loop pond or lake system is very similar in design to that of a closed-loop horizontal system, however the loop is sunk into a source of water as opposed to been buried under the ground. This design is also much less common due to the requirement of a large pond or lake with a sufficient depth. Only one type of heat pump system falls under the open-loop category due to its unique design that utilises two wells of water. 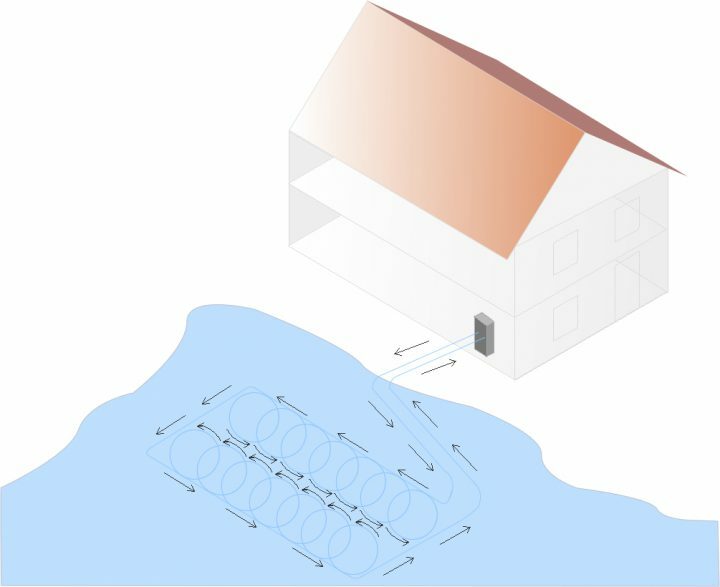 This design uses water stored in a well as the heat exchange fluid that flows directly through a ground source heat pump system. Once the water has been passed through a heat pump, it will be returned to the ground through the well, a recharge well or even via surface discharge. This type of heat pump system is quite rare due to the requirement of one or more wells in the vicinity of the building to be heated. In addition, the water has to be relatively clean in order to avoid damage to the system and provide efficiency.